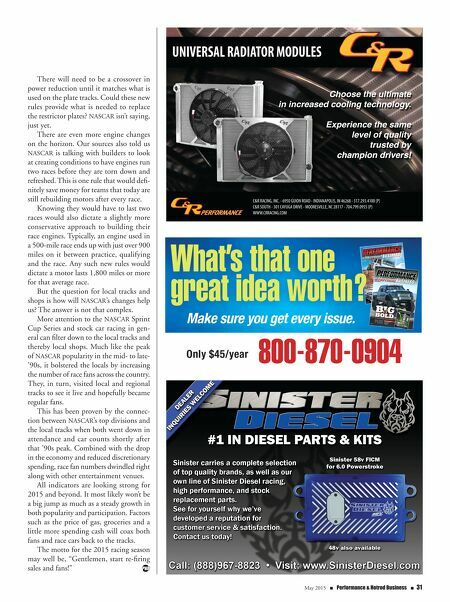 May 2015 n Performance & Hotrod Business n 31 There will need to be a crossover in power reduction until it matches what is used on the plate tracks. Could these new rules provide what is needed to replace the restrictor plates? NASCAR isn't saying, just yet. There are even more engine changes on the horizon. Our sources also told us NASCAR is talking with builders to look at creating conditions to have engines run two races before they are torn down and refreshed. This is one rule that would defi- nitely save money for teams that today are still rebuilding motors after every race. Knowing they would have to last two races would also dictate a slightly more conservative approach to building their race engines. Typically, an engine used in a 500-mile race ends up with just over 900 miles on it between practice, qualifying and the race. Any such new rules would dictate a motor lasts 1,800 miles or more for that average race. But the question for local tracks and shops is how will NASCAR's changes help us? The answer is not that complex. More attention to the NASCAR Sprint Cup Series and stock car racing in gen- eral can filter down to the local tracks and thereby local shops. Much like the peak of NASCAR popularity in the mid- to late- '90s, it bolstered the locals by increasing the number of race fans across the country. They, in turn, visited local and regional tracks to see it live and hopefully became regular fans. This has been proven by the connec- tion between NASCAR's top divisions and the local tracks when both went down in attendance and car counts shortly after that '90s peak. Combined with the drop in the economy and reduced discretionary spending, race fan numbers dwindled right along with other entertainment venues. All indicators are looking strong for 2015 and beyond. It most likely won't be a big jump as much as a steady growth in both popularity and participation. Factors such as the price of gas, groceries and a little more spending cash will coax both fans and race cars back to the tracks. The motto for the 2015 racing season may well be, "Gentlemen, start re-firing sales and fans!" C&R RACING, INC. - 6950 GUION ROAD - INDIANAPOLIS, IN 46268 - 317.293.4100 (P) C&R SOUTH - 301 CAYUGA DRIVE - MOORESVILLE, NC 28117 - 704.799.0955 (P) WWW.CRRACING.COM UNIVERSAL RADIATOR MODULES Choose the ultimate in increased cooling technology. Experience the same level of quality trusted by champion drivers! champion drivers!